Weather – Page 2 – Welcome to Wyandotte Daily! The National Weather Service has issued a thunderstorm warning for southeastern Wyandotte County. The warning is in effect until 6:45 p.m.
At 5:47 p.m., a severe thunderstorm was located over Merriam, Kansas, moving northeast at 30 mph. The storm has 60 mph wind gusts and quarter-sized hail. Damage to vehicles and roofs is possible. Also under the thunderstorm warning are northeastern Johnson County, southern Clay County, southeastern Platte County and central Jackson County. The National Weather Service has issued a severe thunderstorm watch from 5:25 p.m. to midnight Wednesday for Wyandotte County. The storm could include large hail and damaging winds. Other Kansas counties included in the severe thunderstorm watch are Johnson, Leavenworth, Atchison, Linn and Miami. A slight chance of storms is possible tonight, according to the National Weather Service. 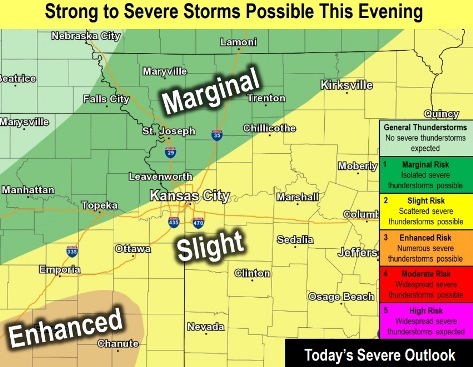 Some storms could be strong to severe between 6 p.m. and 10 p.m., with large hail and damaging winds the primary threats, the weather service said. The stronger storms could be south of Wyandotte County, although Wyandotte County is close to storm area. A cold front is moving into the area, and a line of storms may develop along the cold front. According to the weather service, if the clouds hang around through the late afternoon, then chances for severe weather diminish, and if the clouds break up, then strong to severe storms will be possible. Residents may monitor the weather conditions, which could change, at www.weather.gov. 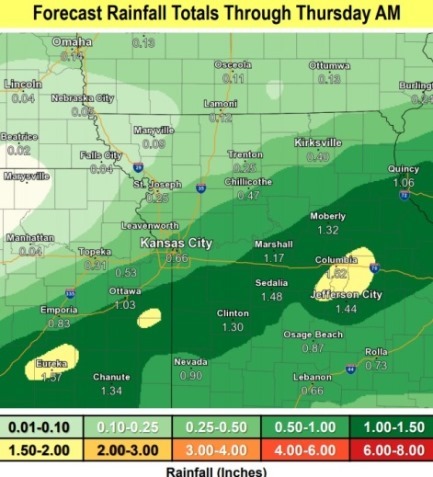 In Wyandotte County, there is a 30 percent chance of showers and thunderstorms after 4 p.m. today, according to the weather service. The high will be near 77 with a south wind of 10 to 16 mph, gusting as high as 29 mph. Tonight, there is a 70 percent chance of showers and storms before 2 a.m., then a chance of showers, according to the weather service. The overnight low will be 48. A west southwest wind of 10 to 14 mph will become north northwest after midnight, gusting up to 23 mph. Between a quarter and a half-inch of rain is possible. Thursday, it will be mostly cloudy with a high near 58, the weather service said. A north northwest wind of 10 to 17 mph will gust as high as 24 mph. Thursday night, the low will be around 42 with a north northwest wind of 9 to 15 mph, gusting as high as 25 mph, according to the weather service. Friday, it will be sunny with a high near 64, the weather service said. A north wind of 8 to 14 mph will gust as high as 23 mph. Friday night, it will be mostly clear with a low of 44, according to the weather service. Saturday, it will be sunny with a high near 73, the weather service said. Saturday night, the low will be around 56 with partly cloudy skies, according to the weather service. Sunday, there is a 30 percent chance of showers and thunderstorms after 1 p.m., with a high near 72, the weather service said. Sunday night, there is a 60 percent chance of showers and a thunderstorm before 1 a.m., then a chance of showers and thunderstorms after 1 a.m., according to the weather service. The low will be around 53. Monday, it will be mostly cloudy with a high near 69, the weather service said. Monday night, it will be mostly cloudy with a low of 51, according to the weather service. Tuesday, there is a 30 percent chance of showers with a high near 69, the weather service said.